There are plenty of reasons to dine at Walt Disney World’s quick service restaurants. They offer easy access to (relatively) inexpensive fare in a wide variety of cuisines, from basic burgers and fries to Moroccan kefta or New Orleans shrimp and grits. 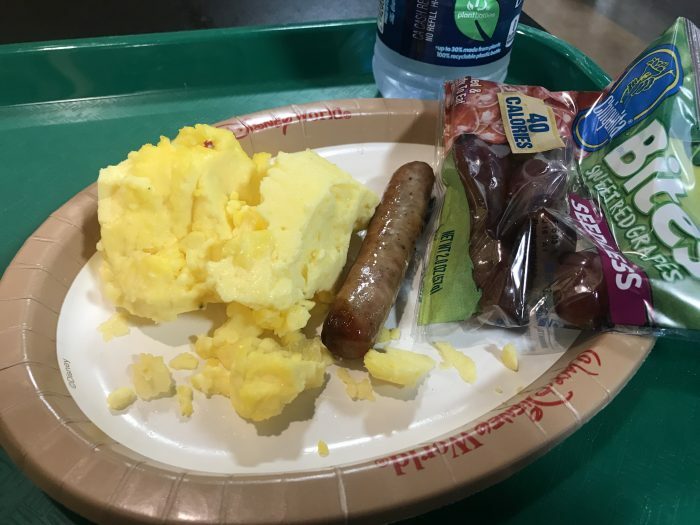 And because there are quick service venues at every WDW theme park, water park, and resort, it’s a near certainty that you’ll end up eating at least a few quick service meals during your Disney World vacation. Assuming you have children with you, that means that your kids will likely be eating some quick service meals too. Here’s a round-up of everything you need to know about kids’ quick service meals at Disney World. Why would I order a kids’ quick service meal? Well, the obvious answer is that you’re at a quick service restaurant and you want to feed a child. However, there are plenty of other reasons to order children’s meals: budgetary issues (kids’ meals are generally less expensive than adult meals), preference for menu items (sometimes you just want some chicken nuggets), portion control (kids’ meals are generally smaller than adult meals), and so on. What does Disney mean by “kids’ meal”? Most WDW quick service menus have a kids’ meal section that states the items are for guests ages 3-9. Technically, kids’ meals are those designed to be consumed by 3 to 9 year olds. So do you have to be ages 3 to 9 to order a kids’ meal? This depends on how you’re paying for your meal. If you’re paying with cash (or credit card, debit card, etc. ), then you can order a kids’ meal for anyone of any age. During a recent long research trip to Disney World, I ordered over 30 different kids’ meals as an adult traveling alone and was never questioned about this. If you’re an adult who wants a smaller portion size or who prefers the kids’ options, feel free to order from the kids’ section of the menu. Similarly, you can order a kids’ meal for toddler under the age of three. However, the rules are different if you’ve purchased the Disney Dining Plan and are using your Dining Plan credits to pay for your meal. More on that below. 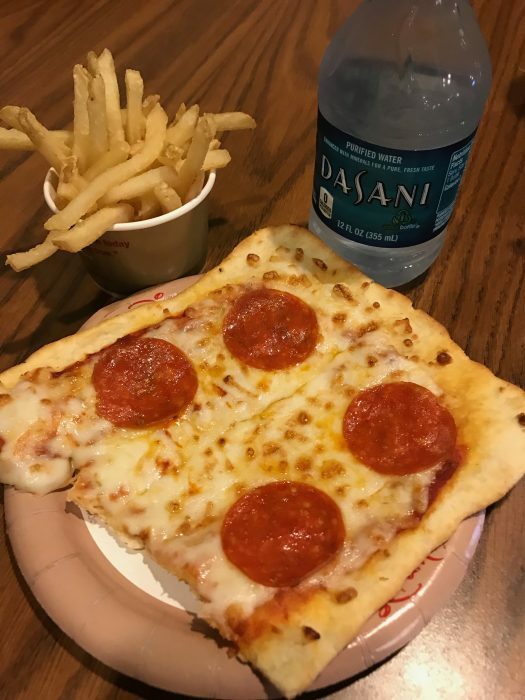 Quick service kids’ pizza from Pinocchio Village Haus in the Magic Kingdom, with the fries side dish option. What kind of foods are on the kids’ menus? Smuckers Uncrustables pre-made peanut butter and jelly sandwich. (These are always grape, never the strawberry sometimes found in grocery stores.) This is by far the most common kids’ meal offering. Those are pretty basic “kid foods.” My child has a more adventurous palate. Are there options for her? There are a few more exciting choices, but honestly, most of the quick service kids’ meals in the theme parks are pretty bland. 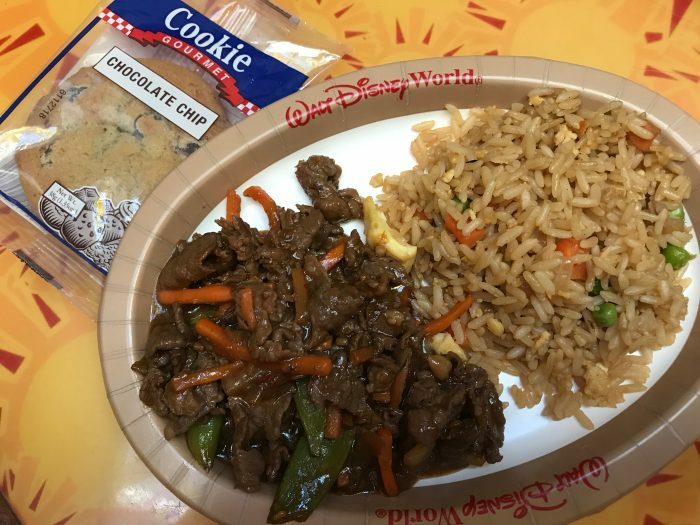 Among the few in-park kids’ quick service meals with any personality at all are the Mongolian beef at Epcot’s Sunshine Seasons, the teriyaki dishes at Epcot’s Katsura grill, the pork carnitas rice bowl at Pecos Bill’s in the Magic Kingdom, and the BBQ ribs from Harambe Market at Animal Kingdom. You can also do a lot to enliven your child’s food using condiments. There’s a decent array of condiments offered at the Disney quick service restaurants. Beyond the ketchup/mayo/mustard/relish found almost everywhere, many restaurants also offer packets of BBQ sauce, soy sauce, honey mustard, hot sauce, honey, lemon juice, and others. You can create a fun dipping sauce for your kid’s boring chicken strips. Don’t assume that a restaurant that offers interesting adult menu options also offers interesting children’s options. For example, Tangierine Cafe, the quick service venue at Epcot’s Morocco pavilion serves kefta and lamb shawarma platters for adults, but the only children’s menu items are a hamburger and chicken nuggets. OK, my kid doesn’t need fancy, but I do want them to eat meals that don’t scream “fast food.” What are my options? Your best bet in the theme parks is Epcot’s Sunshine Seasons. They have a dedicated service line for hot kids’ meals that includes a baked salmon option (one of the very few fish choices) and a chicken drumstick, both of which can be served with a scoop of rice. It looks more like food you’d make a home than food you could buy at a drive-thru. 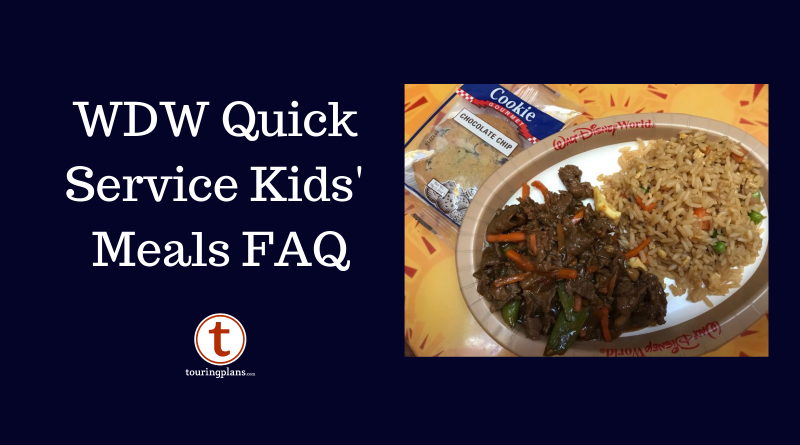 Do the kids’ quick service meals come with any side dishes? There are several places that only have one or two of these items as side dish options. For example, at Columbia Harbor House (Magic Kingdom) the menu only gives the smoothie and the applesauce as side dish options. Are there any fruits on the kids’ menus other than grapes, apples, and mandarin oranges? Not that I’ve seen. You can buy bananas, berries, and cut melon at some park locations, but they are not included as part of kids’ quick service meals. I’m not seeing a lot vegetables on that list. That’s right. 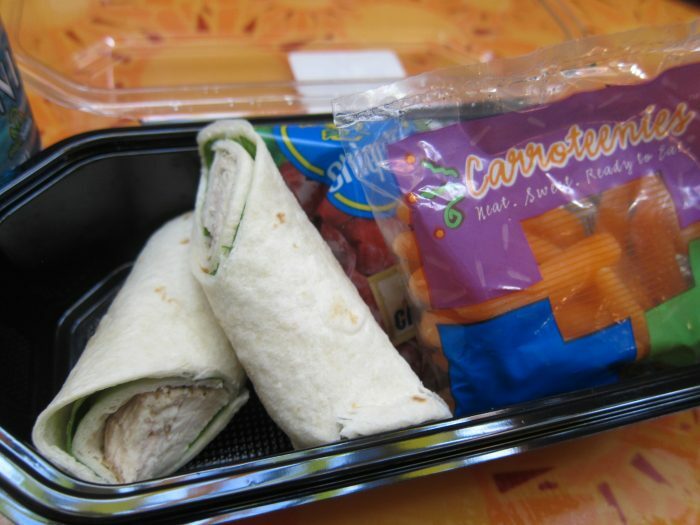 Some, but certainly not all, quick service kids’ menus offer a baggie of baby carrots. Other than that, I can count on one hand the quick service venues in the theme parks that offer veggies as a side. Katsura Grill (Epcot) serves a nice broccolini/corn mix with their teriyaki. 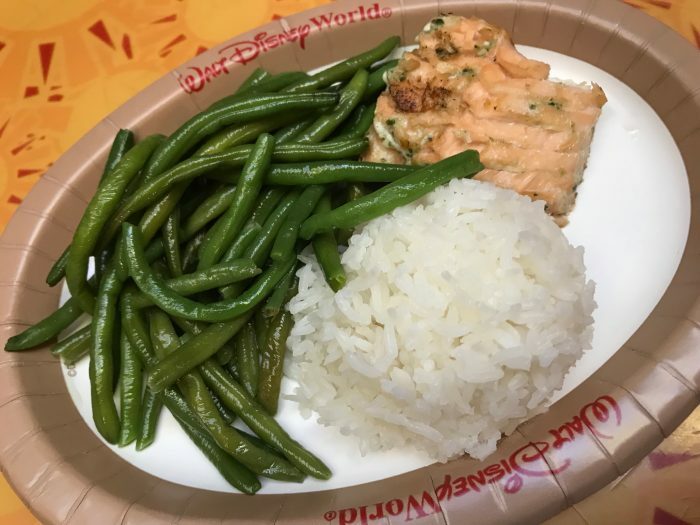 Sunshine Seasons (Epcot) offers steamed green beans with their salmon kids’ meal. A few restaurants offer salads on their children’s menus. Be aware that these are not necessarily vegetable intensive dishes. 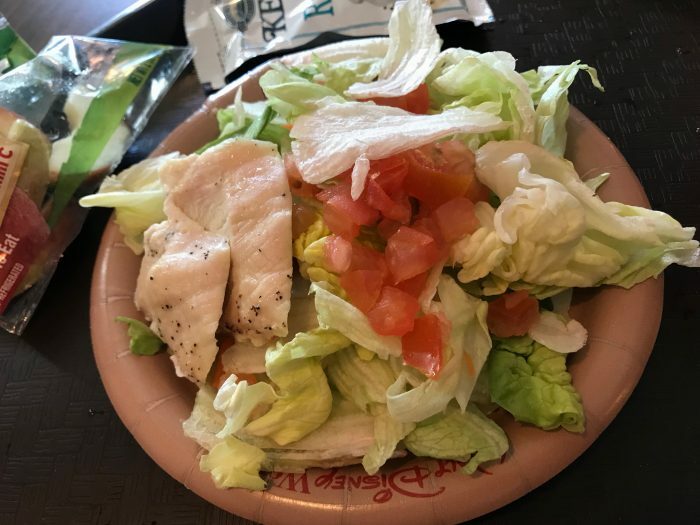 For example, the Columbia Harbor House kids’ menu lists “garden salad with chicken.” This salad is only iceberg lettuce, a sprinkle of chopped tomatoes, and about one ounce of grilled chicken; that’s all. 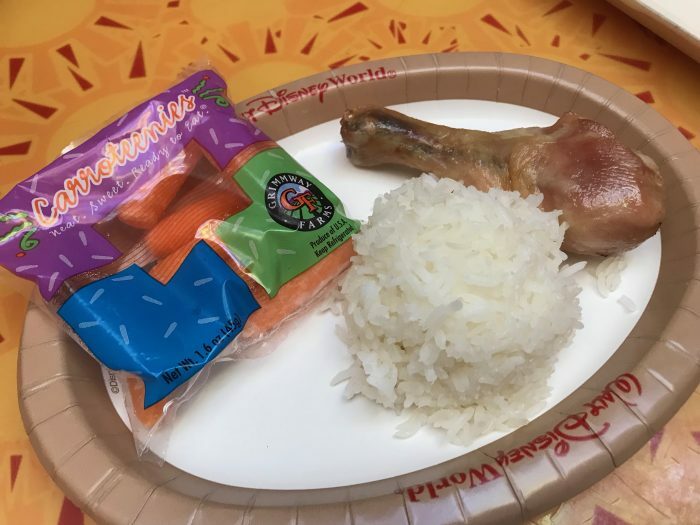 Are there any workarounds for the lack of veggies in the theme park kids’ meals? 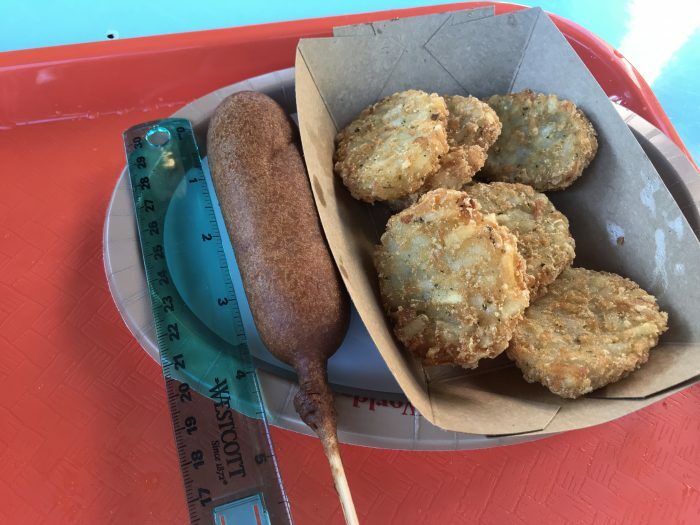 A few of the park quick service restaurants (notably Pecos Bill’s and Cosmic Ray’s in the Magic Kingdom) have “toppings bars.” The toppings bars include items that are intended to dress up a burger or taco: shredded lettuce, diced tomatoes, sauteed mushrooms or onions, pickles, and sometimes other items. These could be added to your child’s plate to create a side salad or to otherwise add a few vitamins to their meal. My child is a vegetarian, what’s available for them on the kids’ quick service menus? The only consistent non-meat options on the kids’ menus are mac n’ cheese, Uncrustables, and cheese pizza. 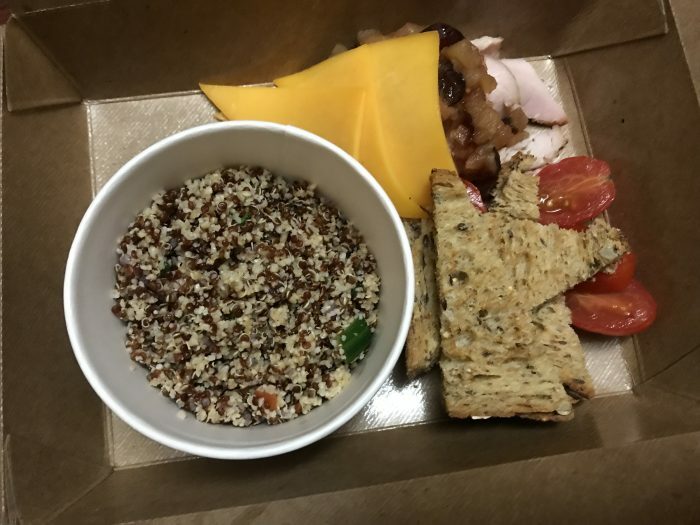 Realistically, if your child is a vegetarian, it will be all but impossible to feed them adequately using only kids’ quick service meals at Walt Disney World. You mention Uncrustables a lot. My child has a nut allergy, should I be worried? 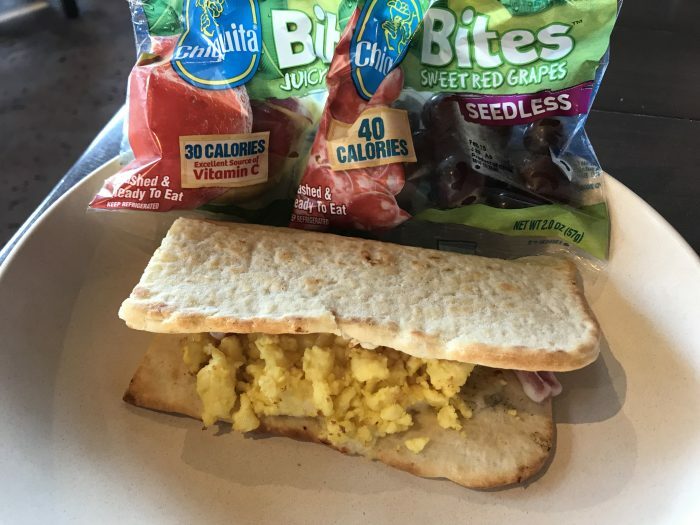 From an allergy perspective, one of the nice things about the ubiquitous Uncrustable is that it is prepared off-site and served in a sealed wrapper. No one in the quick service kitchens is spreading peanut butter around the other food. Of course it’s always possible that another guest could eat an Uncrustable (or other allergen) and could then touch a table or beverage spigot with peanut butter on his on hand, thus spreading a contaminant. But that situation is not unique to Disney. All the Disney quick service restaurants keep a binder in the kitchen which includes the complete ingredient list for every item they serve. You are welcome to ask to look at this binder to understand the ingredients in the food your child is consuming. Just ask anyone behind the counter of a quick service restaurant. There may be off-menu items available to guests with allergies or food intolerances. Again, ask at the counter. You may also want to consult Disney’s official statements related to allergies. 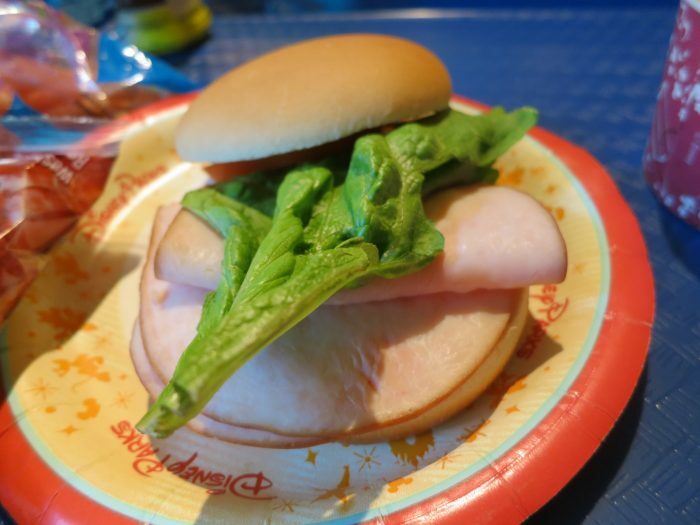 WDW kids’ meal turkey sandwich. Just bread, turkey, and lettuce. 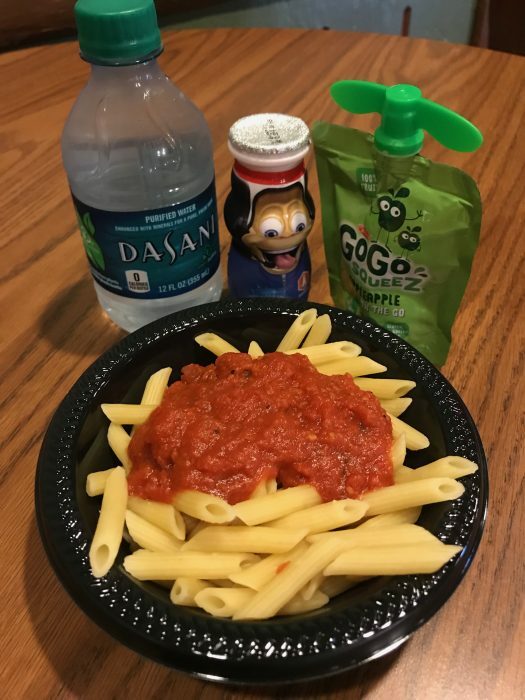 One of the healthier kids’ quick service meals at WDW. Epcot’s Sunshine Seasons salmon and green beans with rice. Unfortunately, I found the salmon to be overcooked. 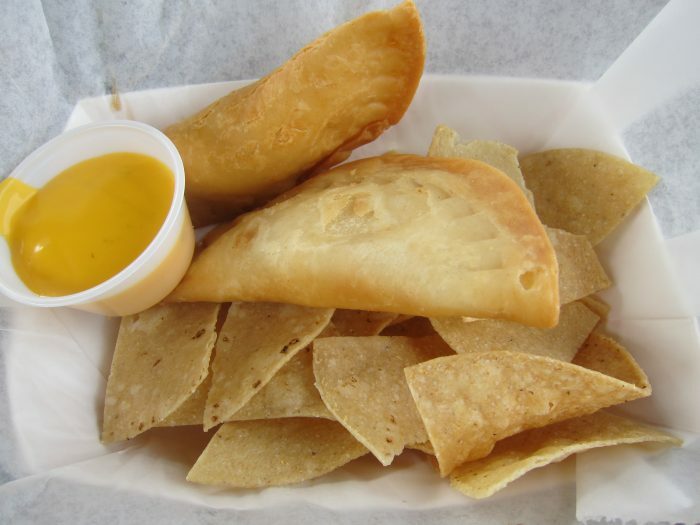 Overall, how would you rate the healthiness of the kids’ quick service menu items? If you look at the menus, you’ll see that many list two categories of kids’ meals: Kids’ Meals and Kids’ Disney Check means. 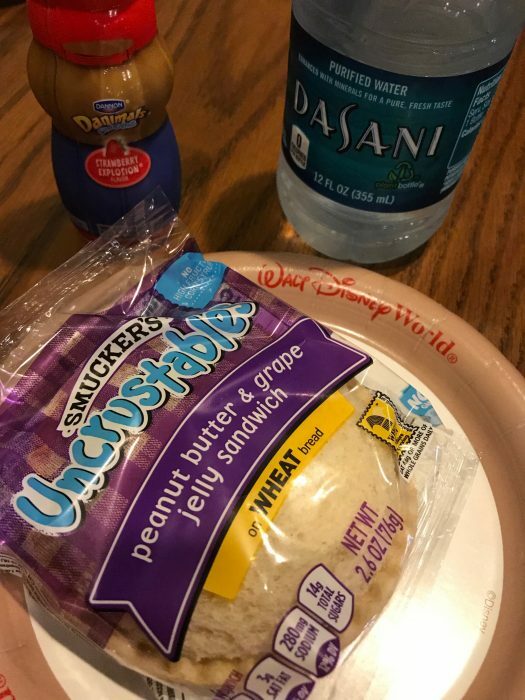 The Disney Check meals have been approved by nutritionists to ensure that they meet a requirements in a variety of healthy eating standards: low sodium, appropriate calories, limited sugar, minimal saturated fat, etc. The meals without the Disney Check seal of approval are those that don’t meet those closely defined nutritional standards. 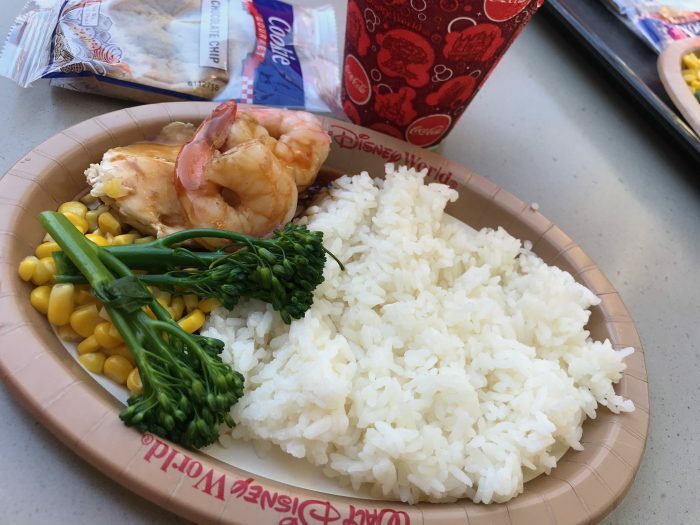 My pick for the tastiest kids’ quick service meal in the WDW theme parks: shrimp teriyaki at Epcot’s Katsura grill in the Japan pavilion. Kids’ quick service meals tend to have reasonable portion sizes for, well, kids. The kids’ meal sandwich and burger buns are 3 inches across. Chicken nugget meals typically come with four modest-sized nuggets. 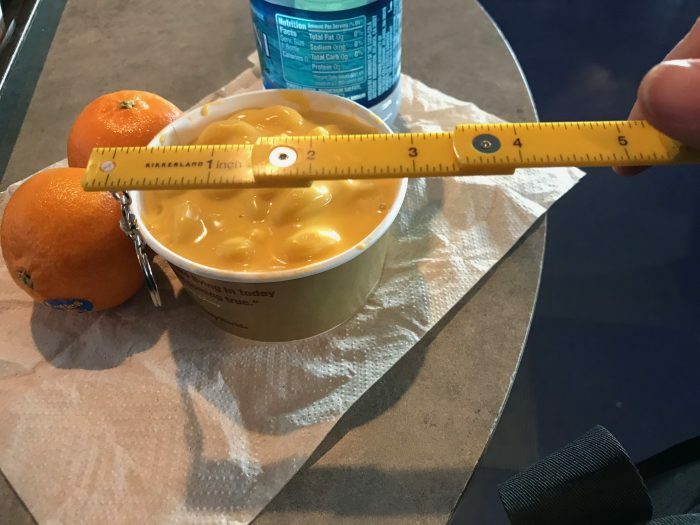 A cup of mac n’ cheese is three inches wide by two inches tall. If you’re an adult and you want to keep portion sizes in check, getting kids’ meals is a reasonable method of doing this. You’ve been talking about kids’ quick service meals in the theme parks. 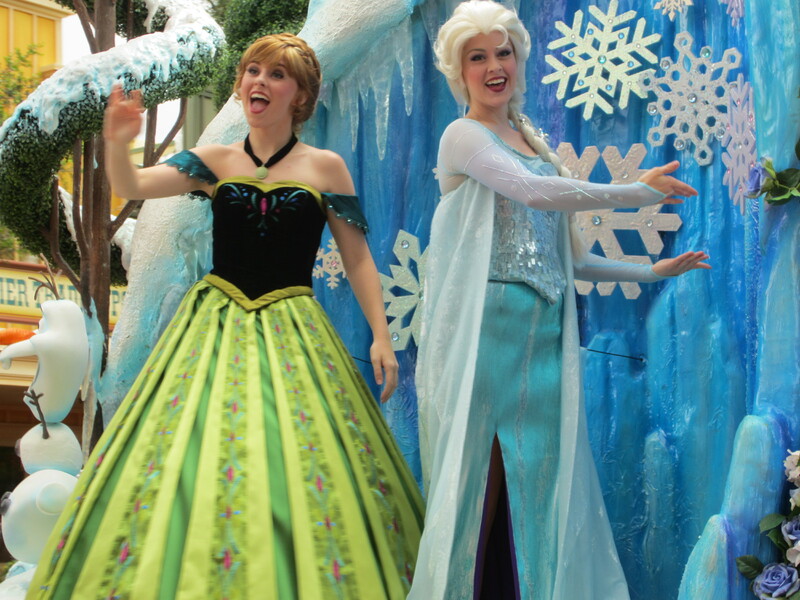 Are the choices any different at the Disney hotels? 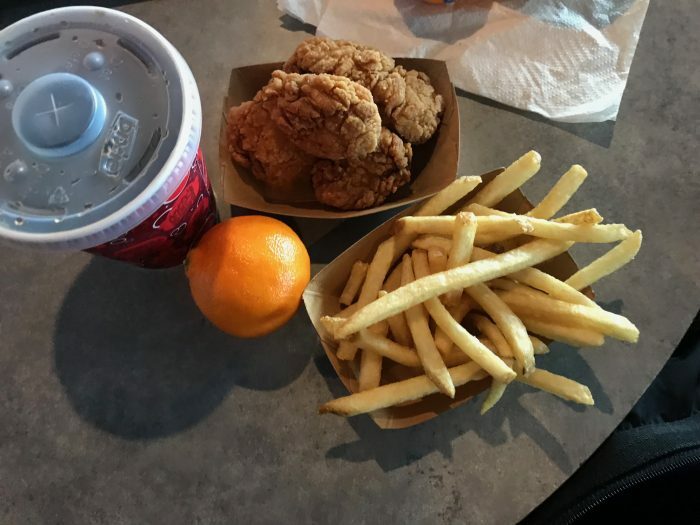 In addition to the line-up of Uncrustables, burgers, and pizza in the parks, the Disney resort quick service restaurants often have more expansive kids’ offerings than those in the parks. For example, Art of Animation’s Landscape of Flavors offers a create-your-own salad option for kids where you can construct something much less anemic than the park kids’ salads. The Riverside Mill Food Court at Port Orleans Riverside offers a chicken kabob served with cucumber slices. Spyglass Grill at Caribbean Beach resort has a chilled shrimp salad with plantain chips on their kids’ menu. Kids’ tuna sandwich from Columbia Harbor House. What about breakfast for kids at the quick service restaurants? The breakfast side dish and beverage options for kids are identical to the lunch and dinner side dish and beverage options. 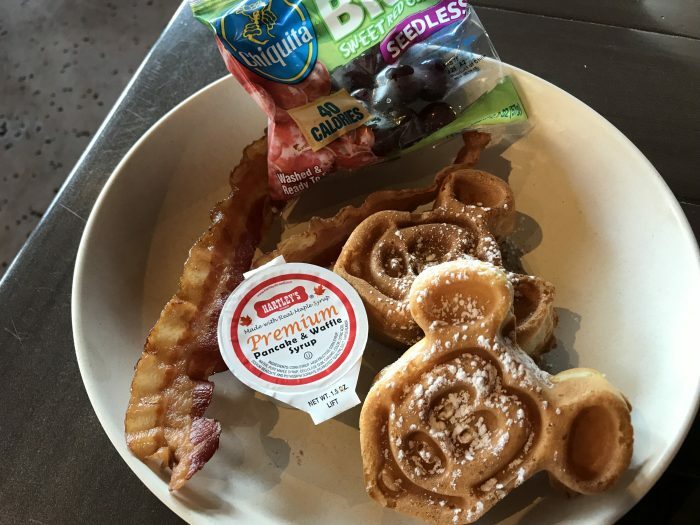 Just like with the lunch and dinner menus, breakfast menus indicate whether specific items meet the Disney Check nutritional guidelines. Kids’ chicken rice bowl from the Magic Kingdom’s Pecos Bill’s Cafe. Shown with “toppings bar” items to add vegetable content. Where can I find the menus for the quick service restaurants? Kids’ drumstick meal at Epcot’s Sunshine Seasons. A similar drumstick is available at Animal Kingdom’s Flame Tree BBQ, but there is no rice side dish option there. How much do kids’ meals cost? 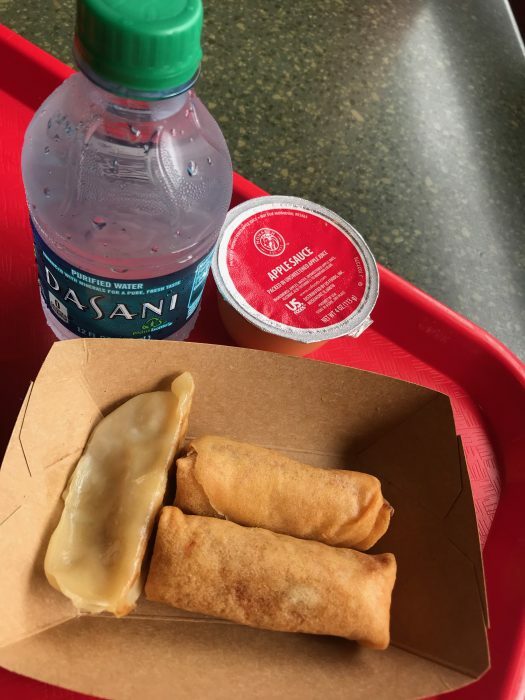 If you’re paying with cash, the vast majority of Disney World quick service kids’ meals cost between $6.50 and $9.00, with most in the lower end of that range. How does the cost of kids’ quick service meals compare to the cost of adult quick service meals? That’s sometimes difficult to say because the child and adult menus may vary considerably at different restaurants. But there are venues where comparison is easy. For example, take a look at the photo of the kids’ pizza meal from Pinocchio Village Haus. You can see that the kids’ pepperoni pizza is just an adult pepperoni pizza cut in half. This kids’ meal, which includes a side dish and a small beverage, costs $6.99. The adult size pepperoni pizza costs $10.49, but this includes neither a side dish nor a beverage. Adding a bottle of water (20 ounce adult size) for $3.50 brings the adult meal cost to $13.99, essentially the same price as two kids’ meals, but missing the side dishes. Adding fries to the adult meal for $4.49 would bring the cost of an adult meal to $18.48. Two kids’ meals would be $13.98, with which you get the same amount pizza, about the same amount of fries (other side dish options are available), and four more ounces of water. In this instance, the kids’ meal is a better value than the adult meal at the same venue. Sometimes the resort quick service kids’ meals are more interesting than those in the parks. This is the Finger Food Sampler at Geyser Point at the Wilderness Lodge. 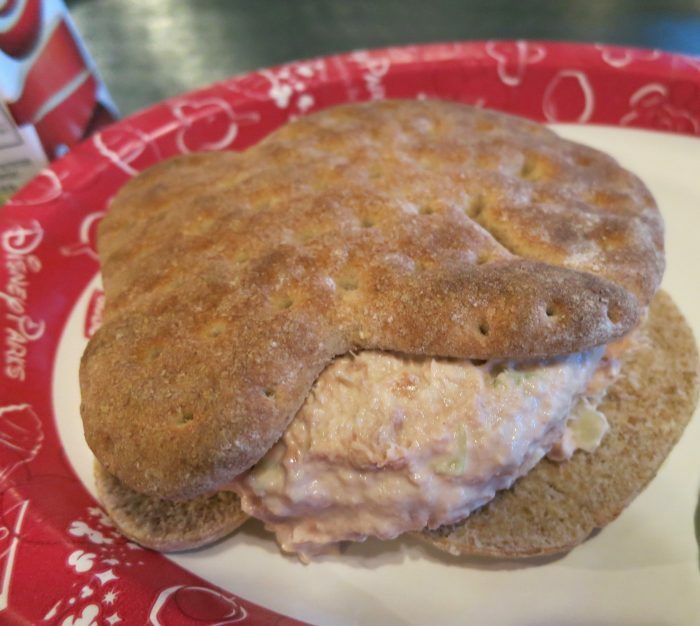 So what’s up with Disney Dining Plan? How does that impact what my children eat? There are several versions of the Disney Dining Plan, which is a means of paying a fixed cost for your food during Disney World vacation. You purchase “Dining Credits” and use those credits to pay for your food rather than paying directly with cash at each restaurant. 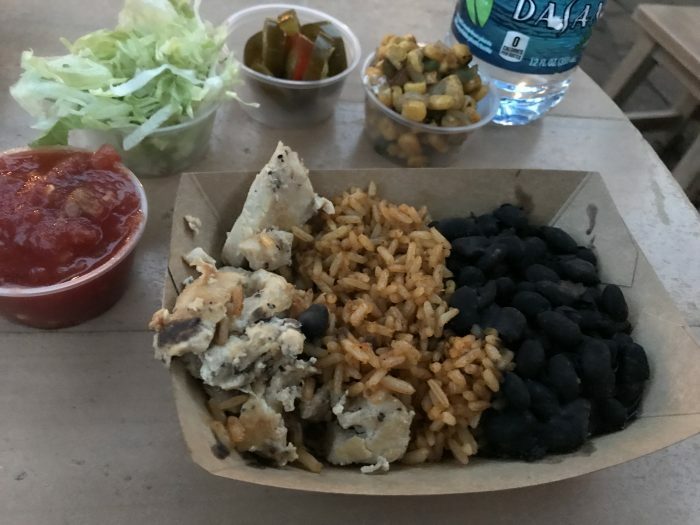 While anyone may eat at any of the restaurants in the WDW parks and resorts, the Dining Plan is available only for guests staying at on-property, Disney-owned hotels, who also buy park tickets and the Plan as part of a vacation package. The first bit of info to note that not every restaurant has a specific kids’ menu. For example, Casey’s Corner, the hot dog restaurant on Main Street in the Magic Kingdom, does participate in the Dining Plan, but has no specific children’s menu. 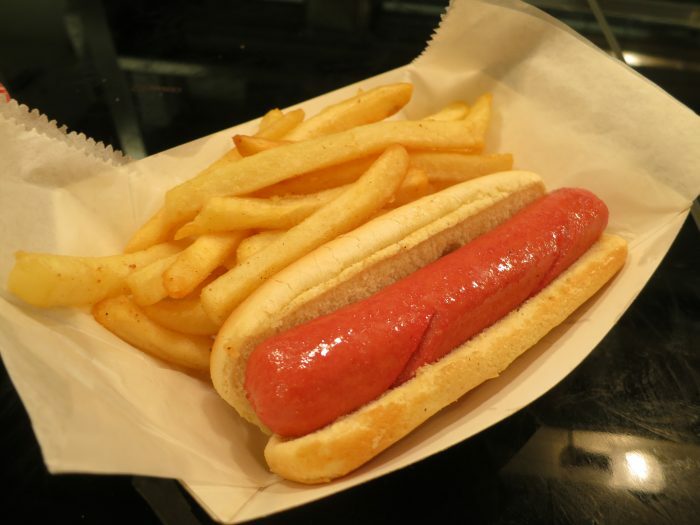 There are hot dogs of various sorts, but nothing specifically designated at “for children.” So, using the Dining Plan there with a group that includes children is easy. Everyone just orders what they want and they you go on about your day. Theoretically, unless you’re in a situation like Casey’s, if you have kids (age 3-9) any you’re on the Dining Plan, you’re supposed to order them items from the kids’ menu. However, in practice, there is no delineation between child and adult quick service meal credits. This means that if you’re paying with credits, most of the time it really doesn’t matter if you order an adult meal or a kids’ meal for your child at a quick service venue. Of course, there’s always a possibility that Disney will start enforcing things differently, or that you’ll get a stickler cashier, so take this with a grain of salt, but for the most part assume that you can get adult meals for your kids if you’re eating at a quick service restaurant and you’re on the Dining Plan. 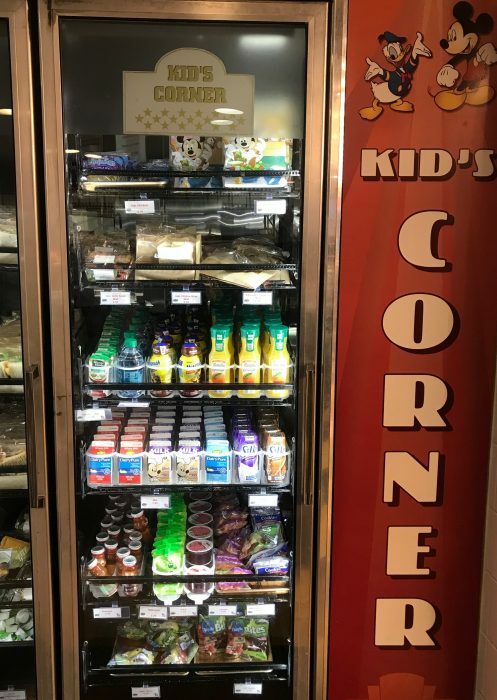 The resorts typically have a refrigerator case where you can find all the kids’ quick service side dish and beverage options in one place. How does this impact the food my kids eat? Well, the adult quick service options are far more varied and far more flavorful than the kids’ quick service offerings. If you have child that’s an adventurous eater, then it’s likely he or she will be happier with the adult fare. If you have a vegetarian child, then eating the adult meals with provide many more acceptable options. Also important is that the portion sizes are different for adult and child meals, with adult meals often twice (or more) the size of kids’ meals. If you’re kids are adventurous eaters, and they’re willing to share their food, then you can use one Dining Plan credit to get an adult meal for two kids to split. This can extend your credits and make the cost of the Dining Plan go further. Standard plain 3″ kids’ quick service hamburger. Is the situation the same at the table service restaurants? No, generally, the kids’ meal vs. adult meal distinction for Dining Plan users is enforced at the table service restaurants. 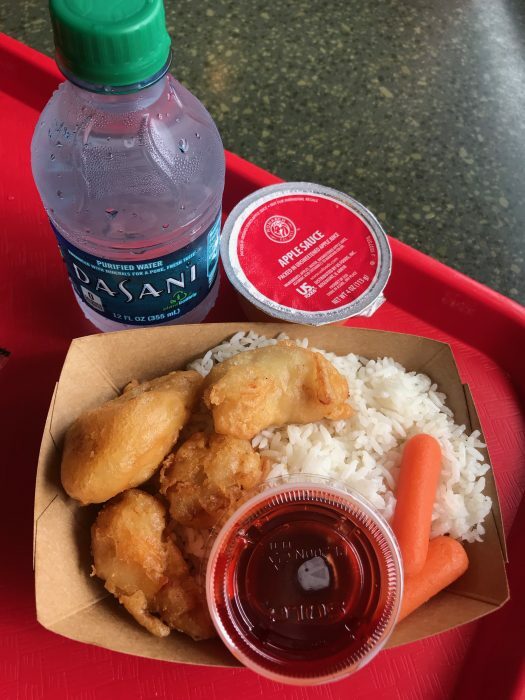 Sweet and sour chicken kids’ meal from Lotus Blossom Cafe at Epcot’s China pavilion. How are the kids’ meals different at quick service restaurants and table service restaurants? There are still some kid food basics like burgers and chicken nuggets on the table service kids’ menus, but in general the offering are much more varied and include a far wider range of side dishes and many more vegetables. There is also more opportunity for meal customization at table service restaurants. For example, at a table service restaurant, if the menu says that a kids’ meal is served with green beans, but the restaurant also offers broccoli elsewhere on the menu, there’s a decent chance you can ask the restaurant to make a swap. This is rarely possible in a quick service situation. At table service restaurants, it is also possible to speak directly with a chef at the restaurant, which can be a godsend if you have a child with allergies and have specific questions about the food prep or ingredients. Kids’ quick service scrambled egg platter. Kids’ quick service ham and egg breakfast sandwich at the Wilderness Lodge’s Roaring Fork. 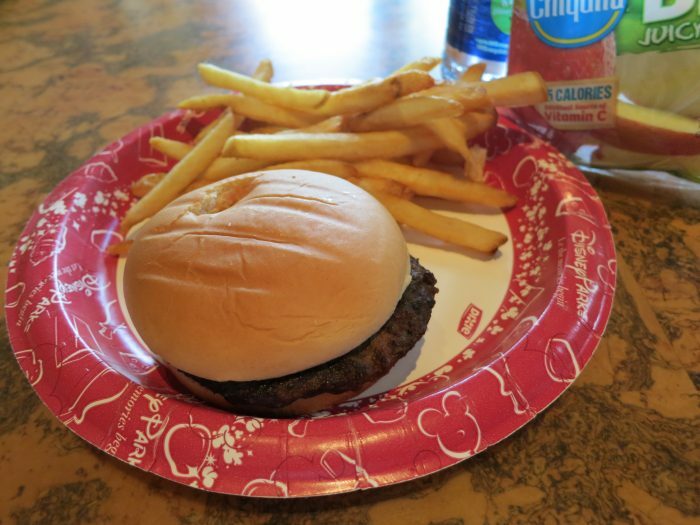 Do you regularly order kids’ quick service meals at Walt Disney World? What have your impressions been of the quality and portion size? Do you order kids’ meals for your children, or yourself? Have you ordered adult quick service meals for your children when using the Dining Plan? Let us know in the comments below. ← SATURDAY SIX: 6 Reasons We Love Universal’s 2019 MARDI GRAS Celebration! 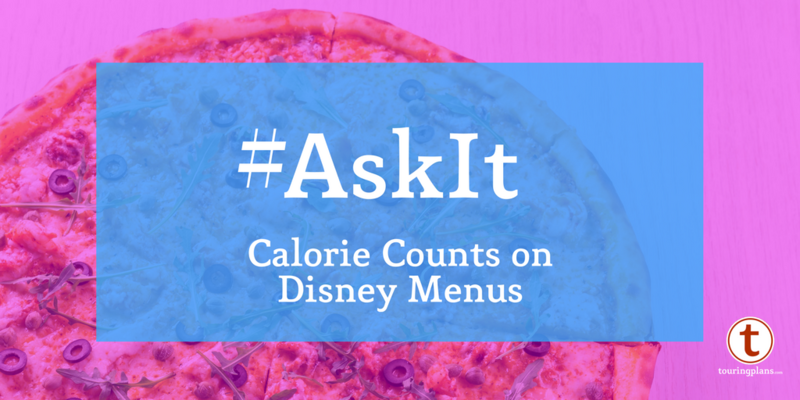 Ask It: Should Disney Post Calorie Counts? With the portion sizes at WDW, we have found that the three of us (Me, wife, and 5 year old son) can order 2 Adult QS meals (on dining plan) and split it among the three of us. That leaves us with an extra credit we can use to get snacks with in the park or for the trip home. We got the Quick Service meal plan and our kids ordered from the adult menu the entire time without an issue. The portion size was sometimes too much but the options were WAY better. For a mom who cares what my kids eat, even on vacation, this was the only option for me. 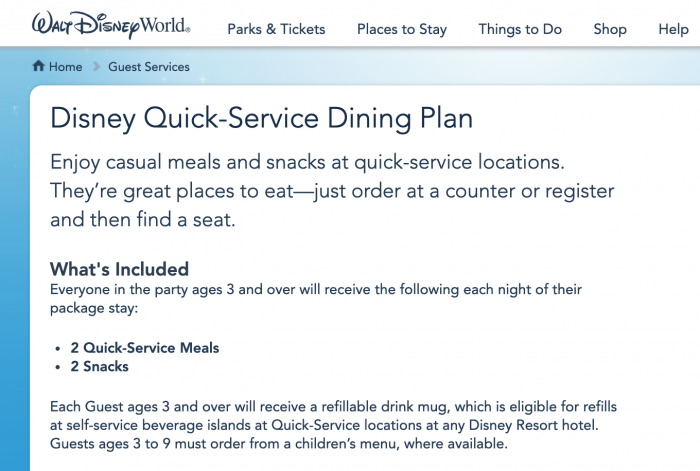 Most guests on the Dining Plans also report that they have been able to get adult quick service meals for children. However, there’s alway a possibility that Disney could decide to start enforcing the policy stated on the website and printed literature. In my experience, QS restaurants don’t ask if you’re ordering for a child or an adult, they just prepare and serve the meal. The problem would come if Disney starts separating meal credits into child and adult. 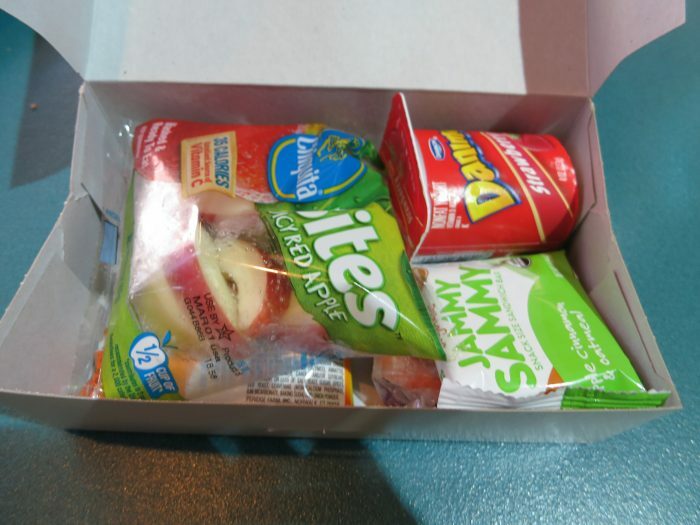 We found the packaged grapes, apple slices and carrots to travel well in the backpack or last overnight in the room mini-fridge for the next day. Good for the rest of the group if the child with you will not partake! And, FYI, the Nesquik for the child meal is half the size of the Nesquik most of the quick service locations carry. Sunshine Seasons educated us on that one. Both good points. The bagged sides are a nice portable treat to save for later in the day. And the Nesquik situation is exactly same as the bottled water situation, where the child size is smaller than the standard adult size.